How to be a ‘Responsible Person’ under the EU Cosmetic Regulation? Since the regulation 1223/2009 on cosmetics products came into force in July 2013, a Responsible Person (RP) must be designated for each cosmetic product placed on the EU market. The Responsible Person guarantees your compliance before the European authorities and therefore makes sure the product is safe for human health under normal and reasonably foreseeable conditions. Follow EcoMundo’s guide on the role and obligations of the Responsible Person! The European regulation EC No. 1223/2009 defines the Responsible Person (RP) in the article 4 as a legal or natural person based in the European Union who will act as the unique representative throughout the EU. The RP’s role is to ensure that each cosmetic product personal care product marketed in the EU countries complies with the Cosmetics Regulation 1223/2009 which aims to establish that the cosmetic product is safe for use. Who can be a Responsible Person? The Responsible Person may be a manufacturer, importer or distributor, but also a consultant likes EcoMundo. Usually, the one who places the product on the EU market will be the one who will ensure this role unless a third person is designated. Nevertheless you have to keep in mind that only a legal or natural person based in the EU can ensure this role. The manufacturer established within the EU is the Responsible Person for the cosmetic products he manufactures (in the EU) if they are not subject to be exported and reimported into the EU. The manufacturer may also designate any person established in the community by mandating someone with a written letter. The designated person may accept the role by responding in writing. The distributor is the Responsible Person if the product is placed on the market under his name or trademark or if he modifies a product already on the market and takes the risk to affect the compliance to the Cosmetics Regulation. The manufacturer or the importer can designate a third person established in the EU to be a Responsible Person. In this case the only formality required by the Cosmetics Regulation is a written agreement. In other words, you must designate your Responsible Person via a written mandate and the RP must accept his role in writing. The designated RP can be any legal or natural person who is able to endorse the responsibilities of the RP and comply with the regulatory requirements, e.g. such as a regulatory expert like EcoMundo. Is it mandatory to have a Responsible Person? Article 4 of the Cosmetics Regulation establishes that only cosmetic products with an appointed Responsible Person may be placed on the market. In other words: a Responsible Person is essential to market your cosmetics. What are the obligations of the Responsible Person? The Responsible Person is in charge of ensuring compliance of the cosmetic product with Regulation 1223/2009 and its amendments. The RP plays an essential role in the marketing process of a cosmetic product. The RP must ensure that the cosmetic product complies with Article 3 of Cosmetics Regulation 1223/2009, that is to say, a “cosmetic product made available on the market shall be safe for human health when used under normal or reasonably foreseeable conditions of use.” ». The Responsible Person ensures that product safety is assessed on the basis of relevant information, and that the safety assessment of the cosmetic product is established under annex 1 of regulation 1223/2009. The Responsible Person may also incorporate information or indications concerning the security in the product safety report. 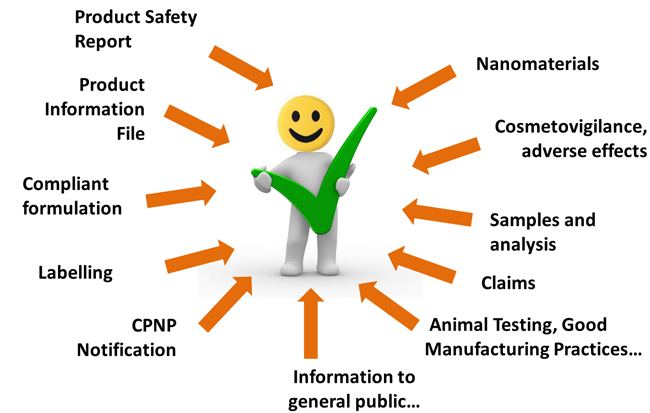 The cosmetic product safety report is kept up to date in view of additional relevant information generated after placing the product on the market. The Product Information File (PIF) must be drafted for each cosmetic product put on the European market. The Responsible Person guarantees that any product placed on the market is linked to a relevant and complete PIF. Learn more about the Product Information File by reading our article on the Product Information File. The Responsible Person must keep the Product Information File for a period of 10 years after placing the last batch on the market. The Responsible Person must ensure that the competent authority of the Member State which houses the PIF can access that file easily (electronic or paper), at the location indicated on the label. 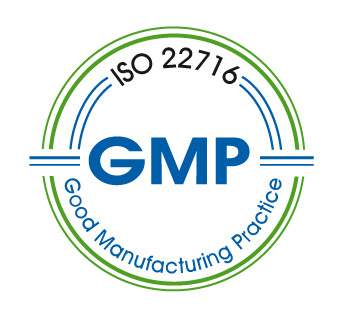 Good Manufacturing Practices (GMP) are issued from the ISO 22716 guideline published in 2007 which provides guidelines for the production, control, storage and shipment of cosmetic products. The Responsible Person must ensure the compliance with GMP according to Article 8 of the Cosmetics Regulation. The compliance declaration must be included in the PIF of each cosmetic product. Therefore, the RP must ensure the compliance of the sampling process and the analysis of the cosmetic products in accordance to Article 12 of Cosmetics Regulation 1223/2009 and also make sure these analyses and samples are reliable and reproducible. In addition the Cosmetics Regulation states: “reliability and reproducibility shall be presumed if the method used is in accordance with the relevant harmonized standards, the references of which have been published in the Official Journal of European Union.”. The Responsible Person, as guarantor of the product’s safety, must verify that the formula meets the Cosmetics Regulation’s requirements. Indeed, some cosmetic ingredients are allowed but some are restricted or prohibited by the Annexes of the Cosmetic Regulation. You must ensure that the product composition placed on the market complies with the restrictions of the Cosmetics regulation. Moreover, the formula must not contain any prohibited substances unless it is a non-intended trace of a prohibited substance, which is technically unavoidable (articles 14, 15, 16, 17 and 24 of 1223/2009 regulation), i.e. incidental ingredients and impurities. What are the critical regulatory statuses? The prohibited substances are classified in annex II of Cosmetic Regulation 1223/2009. The CMR substances (Carcinogenic, mutagenic or toxic to reproduction) are listed in Annex VI of the CLP Regulation (EC No. 1272/2008), and when they are of 2, 1A, 1B categories: they are prohibited. In case there is no appropriate substitute substance after the analysis of alternative solutions. These substances are listed in Annex III of the Cosmetics Regulation, which add up to about 300 substances. These ingredients can be used in cosmetics products only under the conditions described in the annex i.e. product type, purity criteria, percentage of maximal use, etc. Three functions of ingredients are listed by the Regulation: coloring agents, preservatives and UV filters. These ingredients are authorized if they respect the regulation’s restriction i.e. depending on the type of products in which they are contained, the part of the body that is concerned, as well as the concentration of the ingredient in the product. 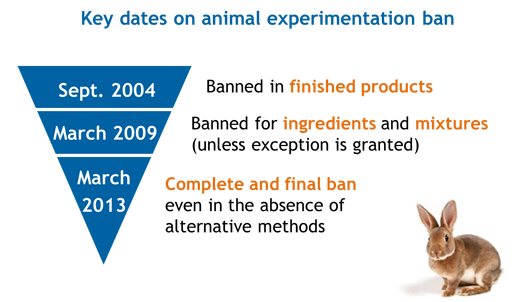 If you use a nanomaterial that is not listed in Regulation 1223/2009 annexes, the Responsible Person takes on the responsibility to notify the presence of the nanomaterial at least 6 months before the cosmetic product is placed on the market. The notification must be done via the CPNP portal. To check the regulatory compliance of cosmetic formulas, the Responsible Person must analyze all Annexes and compare the ingredients in the composition of the cosmetic product. It is important to note that this work should be done regularly as theses Annexes are updated several times a year (on average every three months). Animal testing is prohibited under Article 18 of Cosmetics Regulation No. 1223/2009. Moreover, the Cosmetics Regulation prohibits the marketing of cosmetic products for which the experiments do not respect deadlines explained in the diagram below. The Responsible Person must verify the correct application of the ban. Today, the cosmetic industry has developed alternative tools to avoid animal testing, however, animal testing can be tolerated in some very specific instances, contact us for more details on this matter. * Translation in the language of the export country is mandatory. Note that Austria, Bulgaria, France, Poland, Portugal and Slovakia request full translation of the label, i.e. even the marketing content and claims. What labeling symbols should I use? The Hour-Glass symbol: to illustrate the Date of Minimum Durability (DOMD) when equal or below 30 months. The DOMD is defined by the stability test. You must add the date near the symbol. If the DOMD exceeds 30 months, the open-jar symbol will indicate the period after opening “PAO” defined by the combination of the stability test and challenge test. Labels must contain mandatory indications written indelibly, legibly and visibly. The European Cosmetics Regulation aims to protect consumers and end users of cosmetics in the EU. Therefore, it requires that cosmetic claims be truthful and to not mislead consumers. Therefore, any claim must be substantiated and comply with requirements of Regulation 1223/2009 and Regulation 655/2013 and corresponds to the documents which prove the claimed effect present in the Product Information File. The claims are substantiated by tests and studies included in the PIF. Learn more about claims by reading our dedicated article. In addition to the specific CPNP notification, the Responsible Person must check that the label correctly mentions the presence of nanomaterials by adding the word [nano]. in front of the concerned ingredient, e.g. [nano] titanium dioxide. The Member State in which the cosmetic product is to be placed on the market. Furthermore, Article 13 of the Cosmetics Regulation requires the RP to transmit the original labeling, and packaging photography (if it is legible). The Responsible Person is the main interlocutor of the EU Member States’ competent authorities. The RP keeps the PIF and must make it accessible to the competent authorities upon their request. Article 21 of the EU Cosmetic Regulation 1223/2009, establishes an obligation of transparency to the public. This obligation is also for the Responsible Person. Furthermore, the responsible person must ensure that the name and code number of the composition as well as the identity of the supplier for fragrance and aromatic substances are also available to third parties.. If you’re lost within all of these obligations, it may be good to ask a qualified expert to secure and ensure the marketing of your cosmetic product throughout the EU. Do you have questions about the role of RP? 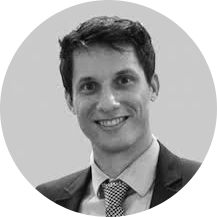 Do not hesitate to contact our expert Sylvain De Backer by phone on +33 (0)1 83 64 20 54 for Europe and for North America please dial + 1 (778) 231-1607 or send an email at [email protected]. What documents must I gather to create my Product Information File? Stay on top of regulatory news! EcoMundo offers you expert advice to understand regulation and ensure your access to the European market. Subscribe to get your monthly dose of regulatory tips and news for the cosmetics industry!